Karen Savell can tell you precisely when her love affair with paint-by-numbers began: “I got a kit for Christmas of a pair of colts. I’ll never forget the smell of the oil paints. When they were finally complete I stood back and was amazed at how lifelike they looked. It was like magic!” Nearly four decades later, Ms. Savell is keeping that magic alive as one of the country’s most prominent paint-by-number restorers. Her work has included everything from rendering popular paintings in a new style to retouching artwork for a major motion picture. Paint-by-number restoration was not always in the cards for Ms. Savell. When she settled down with her husband and two daughters and took on a part-time position as a Licensed Veterinary Technician, devoting herself to paint-by-numbers was a dream she imagined for retirement. She purchased the occasional painting at the local arts and crafts store and could always count on friends and family to chip in with new kits. But with limited space in the house, Ms. Savell had no choice but to store the paintings and wait for an opportunity to exchange them. It was not until Ms. Savell discovered Ebay in 1999 that her self-professed “obsession” with paint-by-numbers gave way to a new career. As she was preparing to ship out her first set of paintings, she took note of the flaws that resulted from aging and stacking. With an eye for detail and a zest for precision, Ms. Savell began experimenting with several techniques to bring the paintings back to their original state. The result was an astounding success. Buyers were so enthralled with the quality of her paintings that they began commissioning her to paint their unfinished paint-by-numbers or to do her own original take of popular classics. Within a few years, Ms. Savell was ready to launch her own paint-by-number restoration business. Thanks to Ebay, Ms. Savell also found access to a growing community of enthusiasts. They had also been avid painters as children and were now revisiting paint-by-numbers as collectors and archivists. She eventually came into contact with Dan Robbins and Doug James, the major designer and collector of the earliest Craft Master paint-by-number kits. Ms. Savell remembers how Doug James became a major force in her development as a restorer: “ He sent me some very valuable canvases to paint for him. I almost fainted when Doug and Dan asked me to paint the first prototype of the Dan Robbins’ ‘Mona Lisa Smile’ kit that promoted the movie. 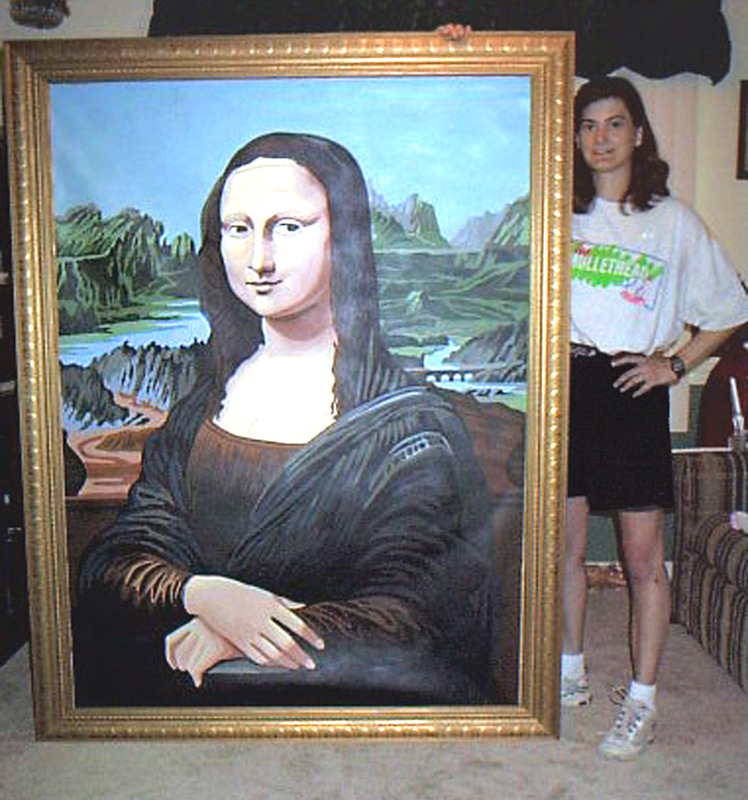 I was completely beside myself to have had the opportunity!” With the support of other paint-by-number enthusiasts, Ms. Savell eventually embarked on a masterpiece project: producing and painting a 44X62 “Mona Lisa”. With a super-sized rendering “The Last Supper” also under her belt, she is looking for new larger-than-life subjects to tackle.